Araucaria columnaris grove in native New Caledonia habitat. Araucaria columnaris, the coral reef araucaria, Cook pine, New Caledonia pine, Cook araucaria, or columnar araucaria, is a species of conifer in the family Araucariaceae. 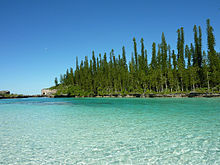 The tree is endemic to New Caledonia in the Melanesia region of the Pacific. It was first classified by Johann Reinhold Forster, a botanist on the second voyage of Captain James Cook to circumnavigate the globe as far south as possible. Araucaria columnaris is a distinctive narrowly conical tree growing up to 60 metres (200 ft) tall in its native habit. The trees have a slender, spire-like crown. The bark of the Cook pine peels off in thin paper-like sheets or strips and is rough, grey, and resinous. The relatively short, mostly horizontal branches are in whorls around the slender, upright to slightly leaning trunk. The branches are lined with cord-like, horizontal branchlets. The branchlets are covered with small, green, incurved, point-tipped, spirally arranged, overlapping leaves. The young leaves are needle-like, while the broader adult leaves are triangular and scale-like. The female seed cones are scaly, egg-shaped, and 10–15 cm. long by 7–11 cm. wide. The smaller, more numerous male pollen cones are at the tips of the branchlets and are scaly, foxtail-shaped, and 2 inches (5 cm) long. The Cook pine can be confused with the Norfolk Island pine due to their similar appearances. A 2017 study found that trees tend to have a uniform tilt dependent on the hemisphere of their location, leaning on average 8 degrees south in the northern hemisphere and the same angle north in the southern hemisphere. Araucaria columnaris is among the most common species of Araucaria planted as an ornamental tree and street tree in warm temperate climates. It is cultivated in gardens and public landscapes in Queensland and Victoria of Australia, northern New Zealand, Southern California, Puerto Rico, Mexico, India, Philippines and Hawaii. ^ Thomas, P. (2010). "Araucaria columnaris". The IUCN Red List of Threatened Species. 2010: e.T42196A10661112. doi:10.2305/IUCN.UK.2010-2.RLTS.T42196A10661112.en. ^ "Araucaria columnaris (G.Forst.) Hook.". World Checklist of Selected Plant Families (WCSP). Royal Botanic Gardens, Kew. Retrieved 13 December 2017 – via The Plant List. ^ a b c d e "Araucaria columnaris". The Gymnosperm Database. ^ Johns, J. W.; Yost, J. M.; Nicolle, D.; Igic, B.; Ritter, M. K. (2017). "Worldwide hemisphere-dependent lean in Cook pines". Ecology. 98 (9): 2482–2484. doi:10.1002/ecy.1850. 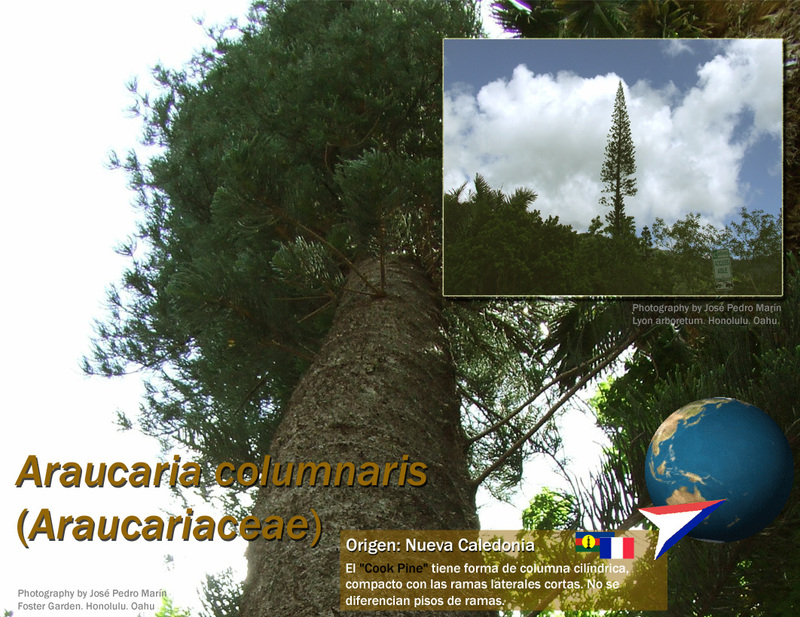 Endemia.NewCaledonia — Araucaria columnaris — distribution maps & text info. Conifers.org: Araucaria columnaris (coral reef araucaria) — description & images. Foster Garden (Honolulu, Hawai'i) — Araucaria columnaris image]. Wikimedia Commons has media related to Araucaria columnaris.